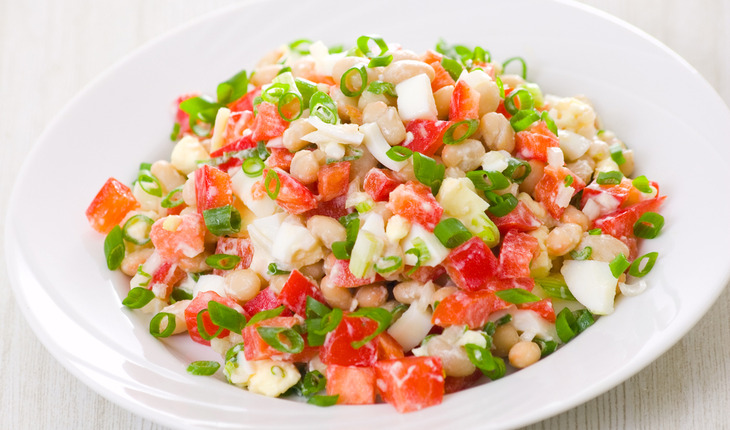 Chopped tomatoes, bell peppers, and cucumbers combine with cannellini beans, almonds, and a simple vinaigrette for a delicious and satisfying salad. In a small sauté pan, toast almond slivers until golden. Remove from pan and let cool. In a medium bowl, toss dressing with all ingredients except lettuce. Refrigerate until ready to serve. To serve, place lettuce leaves on individual plates; top with salad. Chili flakes add a delicious kick!